(May not in fact contain horses). I ran Huntly 10k today, because I could and the price was right. The achilles pain is easing off, meaning I’m edging back into training. Hooray! I decided to wear a silly outfit because I figured it would slow me down and remind me I’m not racing – thanks Helen and Sandra for the morphsuit and tutu components. It all went fine, really. There’s a bit of an ache in me ankle which I’m icing as I type, but it’s not major. I like the variety of the Huntly course, and the river views – it’s like crossing the Harbour Bridge but slightly littler. The costume was rather warm but seemed to make people smile. I was sensible starting and kept a pretty consistent pace. Luckily I knew the k markers were for the half or I might have been confused/excited to have done 2k in 7 minutes. They put a couple of hills in the 10k this year. Sneaky! Athough that didn’t matter, because I wasn’t racing, right? If I have one irritation with today, it was my default runner’s instincts. Hey look, there’s Oscar, I thought around the 7k mark. It would be really cool to chat, maybe we could even cross the line together. And did I? Nope. Whizz, bye. A couple of ks on and I’m slowly slowly slowly getting closer to Tracey, who is awesome and we haven’t run together for aaages. I’ll catch up and we can cross the line, it’ll be great. So did I? Nope. 400m to go and brain says sprint. Thus finish line fun is sacrificed for 6 seconds, in a time that’s 3 minutes or so off a PB and was never meant to be fast. What a knob. Sorry guys! So that was my philosophical lesson of the day: chill the heck out and don’t let the brain’s central governor spoil the fun. The coolest part about the day was possibly the baking. Dead heat between Jenni’s chocolate chickpea cookies and Sandra’s carrot cake muffins. Yum. Also excellent: Hawks rocking the party all over the shop, a few awesome nutters running to the race from Auckland, top notch whanau support, and the fact that I had a tutu over the onesie. Good to be back. 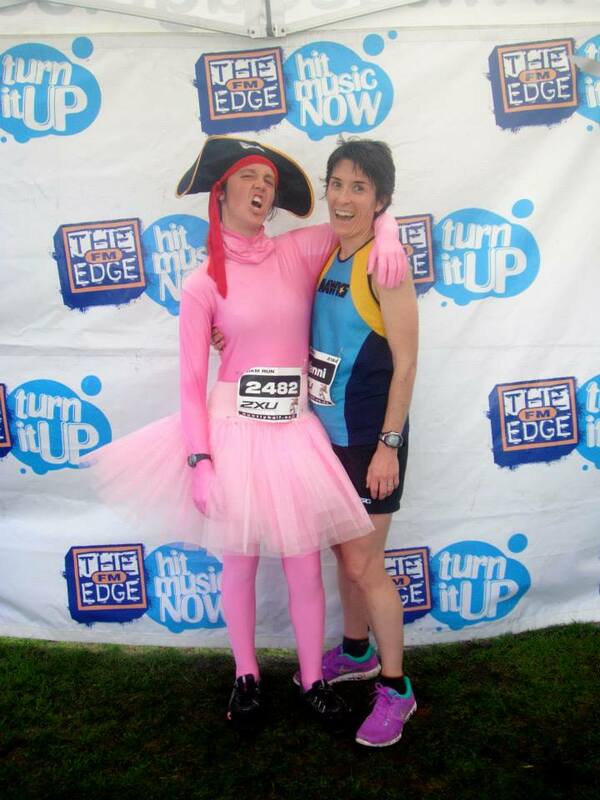 This entry was posted in Race reports by RunningTuff. Bookmark the permalink.